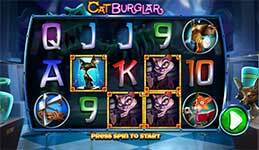 Join a group of feisty feline robbers across 5-reels and 25-paylines as they attempt to pull off the biggest heist in history, in Cat Burglars slot by NextGen! Scour the museum to find rich treasures like the Onyx Idol which can award up to 190 free spins with a 16x multiplier. Wins can reach up to 8,000x your bet with wilds, re-spins and free spins in the Vault feature. Cat Wilds – The Cat Burglar is wild and counts for all other symbols except the scattered Onyx Idol to complete wins. Onyx Idol Scatter – All symbols pay left to right except the scattered Onyx Idol which pay when you hit three or more anywhere on the screen. Feature Trigger Re-Spin – A re-spin feature is triggered when 3 or 4 scattered onyx idol symbols occur on a normal game. The re-spin occurs after line wins are paid. Line wins are not paid again after the re-spin. Any improvement from 3 to 4 scatters triggers a second re-spin. Vault Feature – The Vault Feature is triggered after the Feature Trigger Re-spin is completed. 5 vaults and a keypad are revealed. Each vault requires a random 1, 2, 3, 4 or 5 digit code to open it. 4, 5 or 7 numbers can be selected from the 10-digit keypad for 3, 4 or 5 triggering scatters, respectively.